A mixed bag of everybody's favorites. 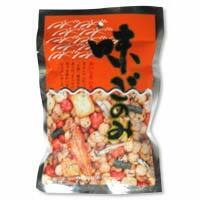 The traditional Japanese "senbei" cracker, made from kneaded rice, baked, and wrapped with dried seaweed. Three types of beans, with sesame, soy sauce, plum, red pepper, and all sorts of flavorings. And dried fish fry to add to the treat.